Acne. Small red bumps on the face (onset 2-4 weeks). Drooling or Spit-Up Rash. Rash around the mouth and on the chin (onset anytime). Erythema Toxicum. Red blotches with small white "pimple" in the center (onset 2-3 days). Skin Injury from Birth Process. From forceps, scalp electrode or birth canal (present at birth). Milia. Tiny white bumps on the nose and cheeks (present at birth). Mongolian Spots. Bluish-green birthmark, often on buttock (present at birth). Stork Bites (Pink Birthmarks). On back of neck or bridge of nose (present at birth). Strawberry Hemangiomas. Raised red birthmarks (onset 2-4 weeks). Port-wine Stains. 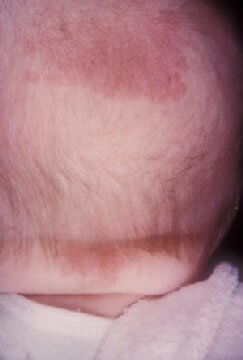 Dark red or purple flat birthmarks (present at birth). Many newborn rashes that have no clear cause are heat rashes. Heat rashes are a pink blotchy area with tiny bumps. They mainly occur on the face, neck and chest. During hot weather, most temporary newborn rashes are heat rashes. Cause: blocked off sweat glands. The openings are so tiny in newborns, that any irritation can block them. Examples are getting any ointment on the skin, friction from clothing or being overheated. Being held against the mother's skin while nursing causes many face rashes. Appearance. Several water blisters or pimples grouped in a cluster. They look like the cold sores (fever blisters) that adults get on their lip. After several days, they crust over. Location. Just one part of the body, usually the scalp or face. Redness. The base can be pink. The pinkness does not extend beyond the cluster of vesicles. Onset. Within the first 2 weeks of life. Importance. Early treatment with anti-viral drugs can prevent serious problems. If you think your newborn's rash looks like herpes, call your child's doctor now. Imitator. Although herpes can be confused with erythema toxicum, they look very different. Pimples (little bumps that contain pus). Exception: looks like erythema toxicum which occurs in half of newborns. More than 30 percent of newborns develop baby acne of the face. Acne consists of small red bumps. 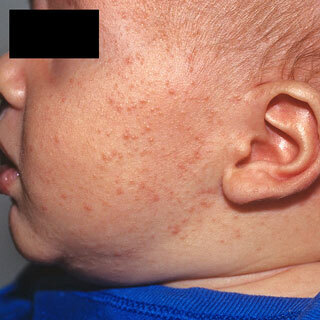 This baby acne begins at 2 to 4 weeks of age. It lasts until 4 to 6 months of age. The cause appears to be the transfer of maternal hormones just prior to birth. Since it goes away on its own, no treatment is needed. Baby oil or ointments make it worse. Many babies have a rash on the chin or cheeks that comes and goes. This is often due to contact with food. It's more common after starting baby foods. In newborns, it can also be from stomach acid that has been spit up. Prolonged contact with spit-up during sleep can cause the rash to get worse. Other temporary rashes on the face are heat rashes. These can occur in areas held against the mother's skin during nursing. Heat rashes are more common in the summertime. Rinse the face with water after all feedings or spitting up. During hot weather, change the baby's position more often. Also, put a cool wet washcloth on the rash. Do this for 10 minutes. More than 50 percent of babies get a rash called erythema toxicum. It starts on the second or third day of life. It's a harmless baby rash that doesn't need to be seen. The rash is made up red blotches. They are ½ inch to 1 inch (1 to 2.5 cm). The blotches have a small white or yellow "pimple" in the center. They look like insect bites, but are not. Red blotches are the main feature. They can be numerous, keep occurring, and look terrible. They can occur anywhere on the body surface, except the palms and soles. Their cause is unknown, but they are not an infection. They go away by 1-2 weeks of age. No treatment is needed. Ointments or baby oil make it worse. The pressure of a forceps on the skin can leave marks. You may see bruises or scrapes anywhere on the head or face. During birth, skin overlying bony prominences can become damaged. You might see this on the sides of the skull bone. This is from pressure from the birth canal. Even without a forceps delivery, you may see bruises or scrapes. Scalp electrodes can also cause scalp scrapes and scabs. The bruises and scrapes will be noted at birth. They will be more noticeable by day 2. They heal over or go away by 1 - 2 weeks of age. A fat tissue injury won't appear until day 5 to 10. Look for a firm coin-shaped lump. It will be under the skin and sometimes with a scab. This lump may take 3 or 4 weeks to go away. For any breaks in the skin, apply an antibiotic ointment (such as Polysporin). No prescription is needed. Use 3 times per day until healed. Milia are tiny white bumps that occur on the face. The nose and cheeks are most often involved. Milia can also be seen on the forehead and chin. Milia occur in 40 percent of newborn babies. Present at birth. Milia are many in number. They occur equally on both sides of the face. Although they look like pimples, they are much smaller (pinhead size). They are not infected. They do not look like water blisters. They are blocked-off skin pores. They will open up. Milia will go away by 1 to 2 months of age. No treatment is needed. Ointments or creams can make them worse. A Mongolian spot is a normal bluish-green or bluish-grey flat birthmark. They occur in over 90 percent of Native American, Asian, Hispanic, and African American babies. They are also seen in 10 percent of Caucasians, especially those of Mediterranean descent. They are present at birth. They occur most commonly over the back and buttocks. However, they can be present on any part of the body. They vary greatly in size and shape. They do not indicate illness or any disease. Most fade away by 2 or 3 years of age. A trace may persist into adult life. Flat pink birthmarks that occur over the bridge of the nose or the eyelids. You can also find them on the back of the neck ("stork bites"). The ones in front are often referred to as "an angel's kiss". They occur in more than 50 percent of newborns. They are present at birth. All the birthmarks on the bridge of the nose and eyelids clear completely. Those on the eyelids clear by 1 year of age. Those on the bridge of the nose may persist for a few more years. Those on the forehead from the nose up to the hairline usually persist into adulthood. Laser treatment during infancy should be considered. Most birthmarks on the nape of the neck also clear. But, 25 percent can persist into adult life. Strawberry hemangiomas are red birthmarks that are raised or increasing in size. Onset usually between 2-4 weeks of age. Most often, start after 3 weeks of age. Sometimes (although rare), they don't appear until the second month of life. They become larger for 1 year. Then, they fade away over 6 to 8 years without any treatment. They run a small risk of bleeding with trauma. Any bleeding should stop with 10 minutes of direct pressure. Discuss with your child's doctor on the next regular visit. Call sooner if you are concerned. Natural course: Do not fade or disappear like stork bites. May become darker. This photo shows a monglian spot on the buttocks. This is a type of colored birthmark. These marks are blue-grey and flat. They are usually irregular shaped with wavy borders. Mongolian spots are not cancerous. This photo shows a Strawberry Hemangioma on the abdominal wall. A hemangioma is a cluster of blood vessels that cause non-cancerous growths. This shows a storkbite which is a birthmark often found in babies. These birthmarks usually go away on their own. 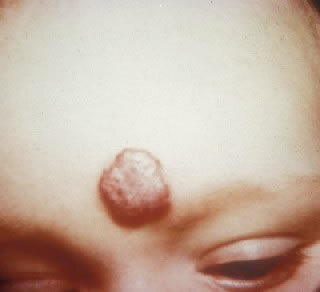 This is a three year old child with a strawberry hemangioma of the lower forehead. Over 50 percent of babies get this rash around the second or third day of life. The rash is composed of ½ inch (1.25 cm) to 1 inch (2.5 cm) red blotches with a small white or yellow lump in the center. The red blotches can be numerous and can occur anywhere on the body (except the palms and soles). They can look quite terrible. The cause of erythema toxicum is unknown. However, it is harmless the rash goes away by 2 weeks of age.